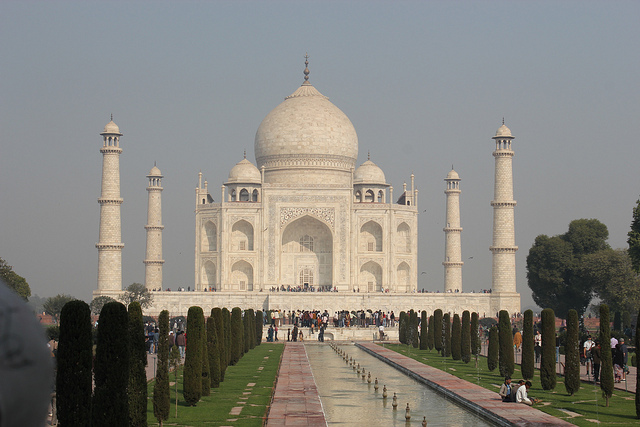 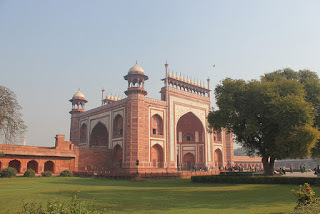 The Taj Mahal is about 180 km south of Delhi. 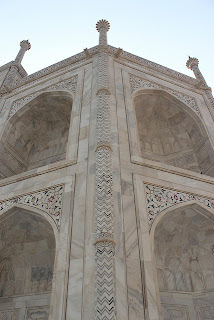 Here are a few photographs taken by ’ö-Dzin when we visited this extraordinary monument on 12th December. 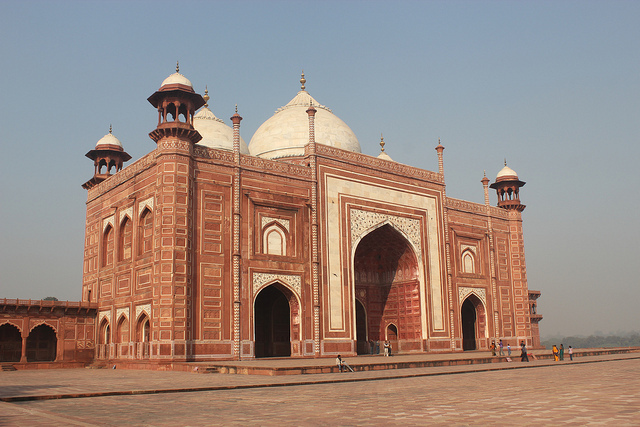 It is more beautiful even than the pictures can portray. 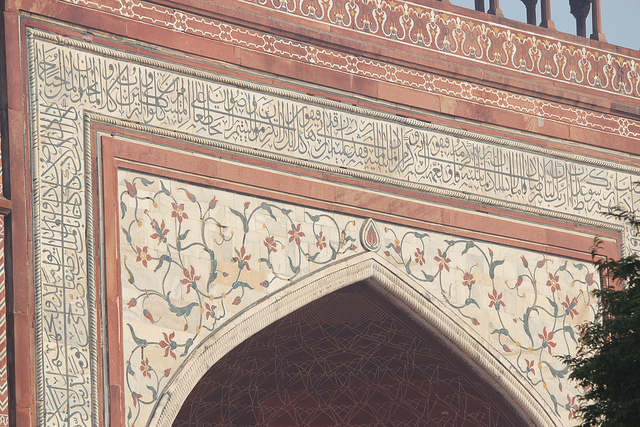 Detail of inlay and Persian script - South Gate. Archway, Taj Mahal mausoleum - also with inlay and Persian script. Pinnacle - our guide told us this used to be gold but was replaced with this iron version by the British. 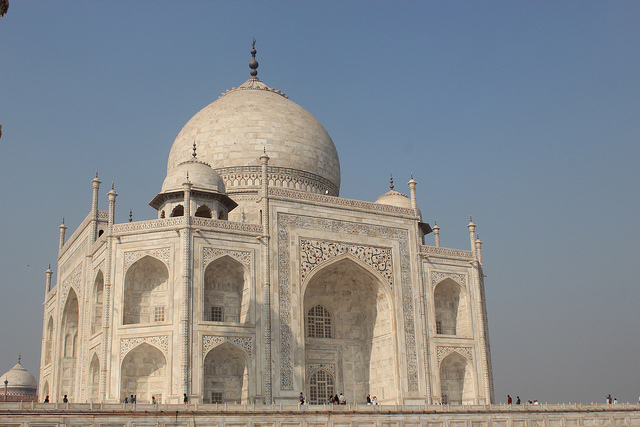 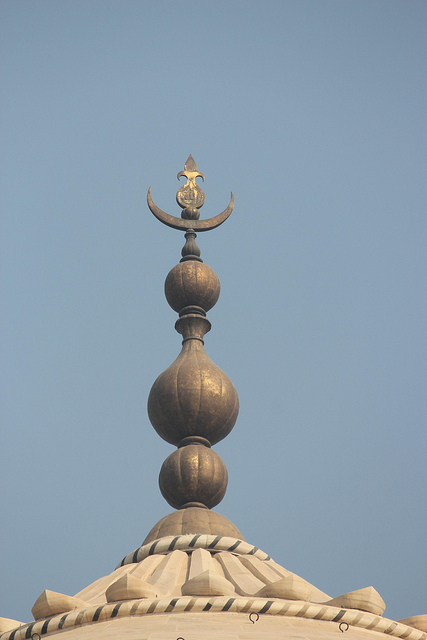 The mosques on the east and west of the white marble mausoleum are identical. Detail of a section of inlay. The marble is carved and pieces of semi-precious stone are skilfully inlaid. 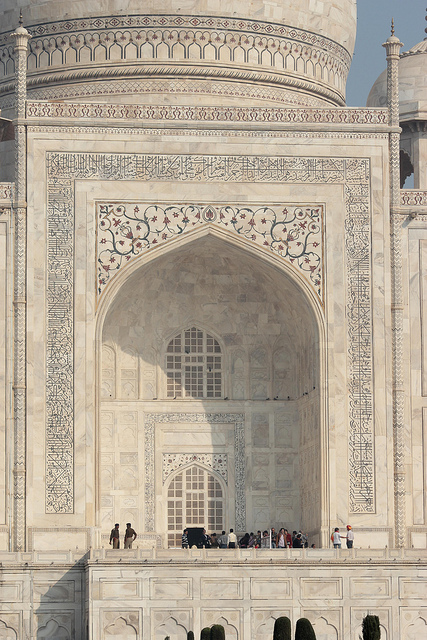 They glint in the sunshine so that the Taj Mahal sparkles. 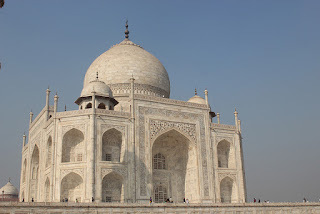 We were told that it is also particularly beautiful by moonlight. 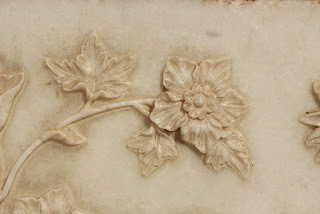 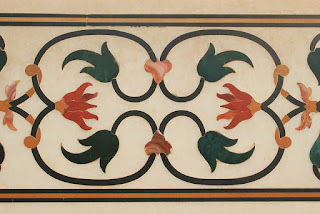 As well as the inlay, many wall panels are decorated with exquisite carving in the marble. 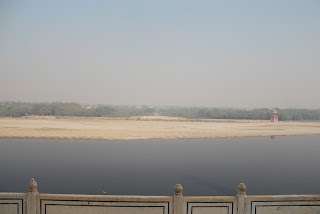 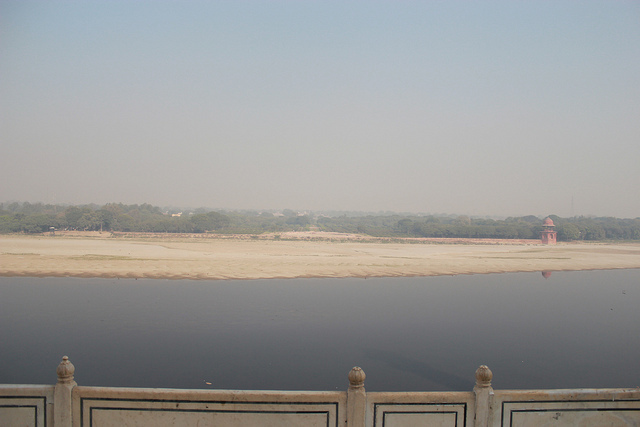 On the northern side, on the opposite bank of the river, are the foundations for the black marble mausoleum that Shah Jahan intended to build. 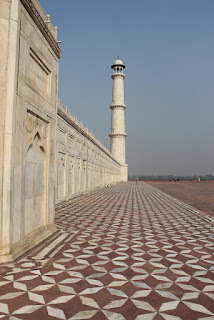 These decorative columns create an optical illusion as you look up them from the ground. 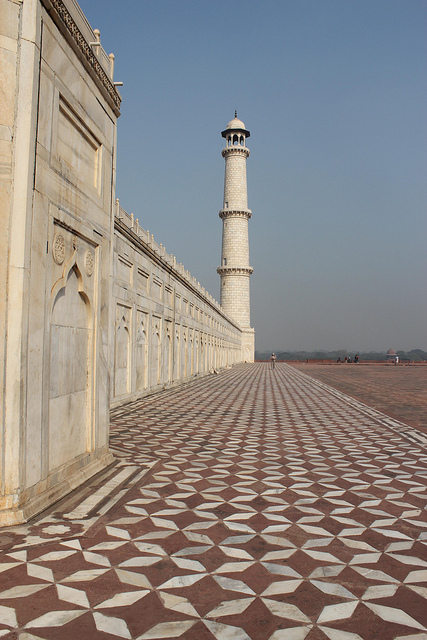 The white marble mausoleum is surrounded by this floor of sandstone and marble. 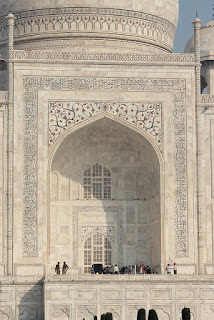 The Taj Mahal from the gardens through the South Gate.